Ibrox Noise: "Just one failure" - is King's assessment fair? "Just one failure" - is King's assessment fair? Dave King’s claim today that only ‘one’ player that was signed by Steven Gerrard of 15 hasn’t worked out has obviously led to the conclusion that the player in question is Umar Sadiq, but crucially suggests a claim that the other 14 have all been successful. It is safe to say that many have indeed worked out, to varying degrees – fans are generally very happy with Connor Goldson, Nikola Katic, Scott Arfield, Allan McGregor, Ryan Kent and Ovie Ejaria to name just six, but would it be equally fair to say the rest have all been ‘successful’? Joe Worrall certainly splits opinion – not overly popular with the fans, the on-loan Forest stopper has not widely impressed with his displays, and it’s safe to say he’s far from a fan-favourite. Gerrard does like him though, a lot. Gareth McAuley looks very good, but has only one full 90 minutes under his belt so that is a premature conclusion until we see more of him. Jamie Murphy can’t be judged this season given his untimely injury at Killie, and would it be even valid to consider him a summer signing? Jon Flanagan started very brightly but seems to have faded a little and is looking jaded recently, enough so that Andy Halliday has taken his place more often than not. Meanwhile after a slow rise and brief peak, Lassana Coulibaly’s form dropped badly following injury and he is not seen as a solid enough starter now, and many fans would rather see Greg Docherty in his place. Then there’s the Osijek pair – Eros Grezda has shown in one match his quality but was dropped for the following fixture so we cannot judge him as a success until he is consistently able to produce it in several matches, while his old chum from Croatian football Borna Barisic has spent more time injured, and didn’t impress hugely beyond deadly delivery from the left. But we do have hopes for them both. And then there’s Kyle Lafferty. He was a signing who excited most of the fans, but it’s safe to say his performances have not quite delivered on that promise. We know what he can do, but he hasn’t really produced it yet. So… in conclusion, it would be fair to say King was generous at best and exaggerating at worst. He’s right to say there’s one clear outright failure, but implying the other 14 signings were all successful is not accurate. What would be more fair is that around six have definitely been, while most of the remaining eight or so all have potential and qualities which, if they are fit and in form, would clearly enhance the team. But very few of them have been fit and in form for the majority of the season enough to actually assert clearly and convincingly that their signings have been successes. However, on the flip side, in form, injured, available or not individual personnel notwithstanding, Rangers still have a cracking chance at the last 32 of the Europa League, and sit comfortably second in the SPL. So, regardless of who has been a success and who hasn’t, something, at present, does seem to be working for Steven Gerrard. No mention of the biggest waste, then? Mr Carlos Pena?? Caixinha signed him. Gerrard has only inherited him. You never know with that one though, but i'm sure we'll find out very quickly. I would say 50/50 we are only 2pts off the tramps so we should be happy with what we have it's when we play them at ibrox we can judge it better then. I agree with King that only Sadiq has failed and looks short of Rangers quality. 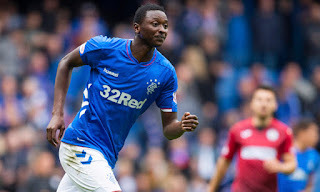 All the others have shone at some stage, some more regularly than others, and give me hope that they have the ability to be good Rangers players.